While attending the baby shower of a dear friend on Monday, I got a lot of questions about my bees. It’s actually become something of a common occurrence since we got them earlier this year. 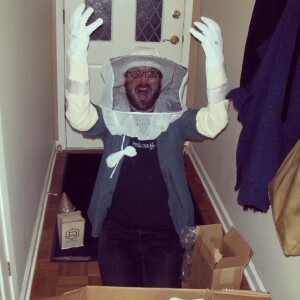 Stephen and I have even been referred to as “The Bee People”, which is pretty cute when you think about it. It all started about this time last year when we didn’t really reap the benefits of gardening. Great for physical activity, but getting fruits and vegetables ain’t too shabby either. So why was our first year such a bust? One reason is that North Texas soil is mostly clay and leaves no room for organic matter. Another reason was having to hand-pollinate everything (get your mind out of the gutter). That’s when Mr. Hoff (my husband for those just tuning in) started toying with the idea of getting a beehive. Not only would it be good for the garden, but we’d also get honey at the end of the season. It definitely wasn’t the worst idea in the world. I’d love to pretend that I had a choice in the matter, but I was really just along for the ride. Stephen and Monica Rial went in together on supplies. She helps us get the materials, we give her all the honey she wants… Not a bad deal. End of the day, they went with Dadant for all the supplies. The prices are decent and they have a long-standing reputation in the beekeeping community. 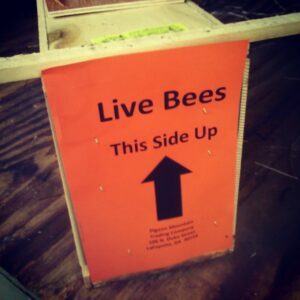 Pigeon Mountain Trading hooked us up with our bees. Turns out that one of the most ideal breeds for beginners are Italian. They’re sold in a three pound box which comes with about 10,000 bees and a queen. The queen is kept separate so the bees can get used to her pheromones. After a delay thanks to Homeland Security, the bees arrived in early April and not a moment too soon! Some had already died because of there stay with the DHS. Keep the bees in a dark, cool place to calm them down. Let them get settled in their new digs. Before doing so, spray them with warm water. It prevents them from flying off. 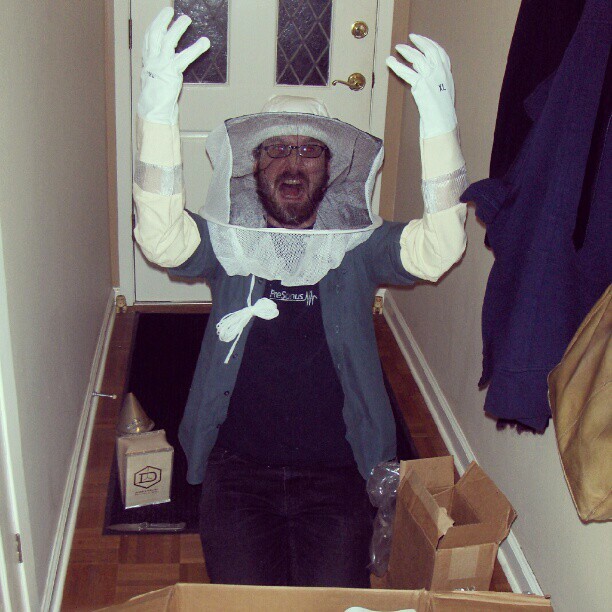 Dump the bees into the hive and get the heck out of there (check out Stephen’s experience)! The queen gets to chill out in her little queen bee box inside the hive. Just poke a hole in the candy plug at the end of the box so the worker bees can eat through it and release her when they’re ready to accept her. Close up the hive and sit pretty for 3 days. Three days later… Queen Monica was still in the box. We removed the cork stopper, manually released her, and sealed up the hive for a week. Evidence that the queen is laying (i.e. doing her job). Week later… Zilch. Queen Monica has done nothing and that is a pretty big problem. If the queen doesn’t begin to lay, the hive will swarm away in search of a new home and produce their own queen. 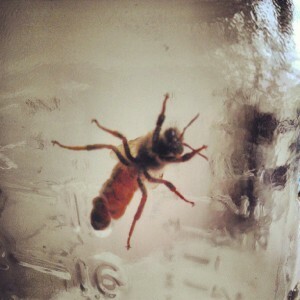 Stephen contacted the supplier and they sent a new queen immediately. Once we located Queen Monica, Queen Joel (named after Joel McDonald) took her place. Hours after dethroning her, Queen Monica died. Good thing we got a replacement. Queen Joel laid eggs immediately (really doesn’t sound right, does it?). The hive grew, but it definitely wasn’t as big as it should be. A decent hive has about 60,000 bees. Before we knew it, it was fall and winter was fast approaching… Bye, prospective honey. As the weeks went by, Stephen began to notice that hundreds of bees were dying… Was there not enough food at the beginning?… Was the hive too weak from the get-go? First thought was that it might be from the cold snap, but then he noticed that their tongues, DID YOU KNOW BEES HAVE TONGUES? !, were sticking out and their legs were back. All the indications of pesticides… Fantastic. Was the Doty-Hoff hive one of several colonies suffering from Colony Collapse Disorder? Doubtful. Bees just leave in most cases. In the morning the hive will be going strong and by afternoon the hive is empty. They just disappear, no bodies or anything. Last week it looked like all of our bees had died… Bees enter a state of torpor, similar to hibernation, when they get cold so they look dead. Couple of warms days after Cleon, the bees are flying around… Not a large amount though. Haven’t located Queen Joel either. If she’s dead, the hive won’t die immediately. The worker bees will start laying eggs in an attempt to raise their numbers. Sound great in theory, but laying worker bees will only produce more workers. Without a laying queen to produce the genetics the hive needs, their days would be numbered. If we have to get another batch of bees, maybe we’ll get a breed called “buckfast”. They do very well in winter, produce more than a hundred pounds of honey, are very gentle, and build up their numbers fast. There’s been this realization that bees are an important natural resource. They pollinate many of the crops we depend on. With the decline of hives reaching 30% annually, we’re gonna do everything we can to help keep the species alive. 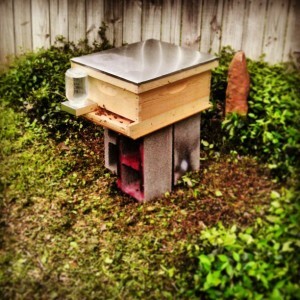 What started out as a garden boost has turned into a love for all honey bees.